For other people with the same name, see Joe Quinn (disambiguation). Joseph "Joe" James Quinn (December 25, 1864 – November 12, 1940) was an Australian second baseman who played 17 seasons in Major League Baseball. Born in Ipswich, Queensland, to Patrick Quinn and Catherine, née McAfee, both from Ireland, he was the only Australian-born player to reach the major leagues until 1986. 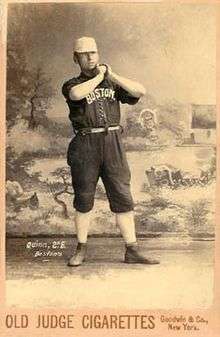 Quinn started his career in 1884 with the Union Association's St. Louis Maroons, which won the pennant. He was one of few players from that league to later find success in the National League. Throughout his career, Quinn was known for his defensive skills, and he led NL second basemen in fielding percentage twice. Quinn also had two stints as a big league manager, with the St. Louis Browns in 1895 and the Cleveland Spiders in 1899. His Browns club went 11–28 under his guidance, and the Spiders were even worse, going 12–104. His career .148 winning percentage is one of the lowest in baseball history. He was, as a player, arguably the best hitter on the Spiders team that he managed, which is considered to have been the worst team in major league history. In 1894 and 1896, he served as an umpire for the National League. In the offseason, Quinn was a mortician, and he owned a funeral home after his playing days ended. He died at age 75 in St. Louis, Missouri. Quinn was inducted into the Baseball Australia Hall of Fame on 4 May 2013. In 2014, the Australian sports writer Rochelle Llewelyn Nicholls published a biography of Joe "Undertaker" Quinn as Joe Quinn – Among the Rowdies. ↑ Some sources give 1862 as his year of birth. ↑ "Mary Ellen McGrath Quinn (his wife)". Find a Grave. 8 May 2009. ↑ Llewelyn Nicholls, Rochelle (2014). Joe Quinn – Among the Rowdies. McFarland & Company. ISBN 978-0786479801. The Editors of Total Baseball (2000). Baseball:The Biographical Encyclopedia. Sports Illustrated. p. 909. ISBN 1-892129-34-5. Frank Russo (1 July 2003). "Joseph J. Quinn". Find a Grave.